How important are amino acids? Consider sickle cell disease. People with sickle cell disease have red blood cells that, under certain conditions, can become rigid and sickle-shaped. Those sickle-shaped cells can become stuck in capillaries, blocking them. In severe cases, it can block enough of the blood supply to cause damage to several organs, such as the kidneys, liver, and spleen. This happens because of a mutation in hemoglobin, the protein in red blood cells that transports oxygen. Remarkably, the difference between the normal form of hemoglobin, HbA, and the one that causes sickle cell disease, HbS, is a seemingly minor one. All it takes is a change in a single amino acid on the surface of hemoglobin: the sixth amino acid in two of its four chains is changed from glutamic acid to valine. That minor difference allows the deoxygenated form of HbS to polymerize and precipitate, which leads to the sickled shape—and all the symptoms of—sickle cell disease. In this chapter, we'll take a look at the basics of proteins by focusing on the amino acids that compose them, and how those amino acids contribute to the physical and chemical properties of proteins. Amino acids are molecules that contain two functional groups: an amino group (–NH2) and a carboxyl group (–COOH). In this chapter, we'll focus specifically on the α-amino acids, in which the amino group and the carboxyl group are bonded to the same carbon, the α-carbon of the carboxylic acid. Think of the α-carbon as the central carbon of the amino acid, as shown in Figure 1.1. As you saw in Chapter 8 of MCAT Organic Chemistry Review, remember that for carboxylic acids, the α-carbon is the carbon adjacent to the carboxyl carbon. In addition to the amino and carboxyl groups, the α-carbon has two other groups attached to it: a hydrogen atom, and a side chain, also called an R group, which is specific to each amino acid. The side chains determine the properties of amino acids, and therefore their functions. The side chains (R groups) of amino acids determine their chemical properties. Amino acids don't need to have both the amino and carboxyl groups bonded to the same carbon. For example, the neurotransmitter γ-aminobutyric acid (GABA) has the amino group on the gamma (γ) carbon, three carbons away from the carboxyl group. Similarly, not every amino acid found in the human body is specified by a codon in the genetic code or incorporated into proteins. One example is ornithine, one of the intermediates in the urea cycle, the metabolic process by which the body excretes excess nitrogen. There are also some amino acids that are specifically modified for specialized roles in the body; for example, lysine is sometimes converted into pyrrolysine, and cysteine is sometimes converted into selenocysteine. That said, the Association of American Medical Colleges (AAMC) has specifically stated they'll focus on the 20 α-amino acids encoded by the human genetic code, also called proteinogenic amino acids. So, for the rest of this chapter, we'll use the term amino acid to refer specifically to these compounds. 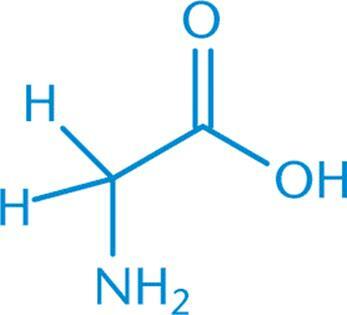 While the MCAT could include passages on GABA or other nonstandard amino acids, they are not part of the background information you're expected to know for Test Day. For most amino acids, the α-carbon is a chiral (or stereogenic) center, as it has four different groups attached to it. Thus, most amino acids are optically active. The one exception is glycine, which has a hydrogen atom as its R group, making it achiral, as shown in Figure 1.2. All chiral amino acids used in eukaryotes are L-amino acids, so the amino group is drawn on the left in a Fischer projection, as demonstrated in Figure 1.3. In the Cahn–Ingold–Prelog system, this translates to an (S) absolute configuration for almost all chiral amino acids. The only exception is cysteine, which, while still being an L-amino acid, has an (R) absolute configuration because the –CH2SH group has priority over the –COOH group. 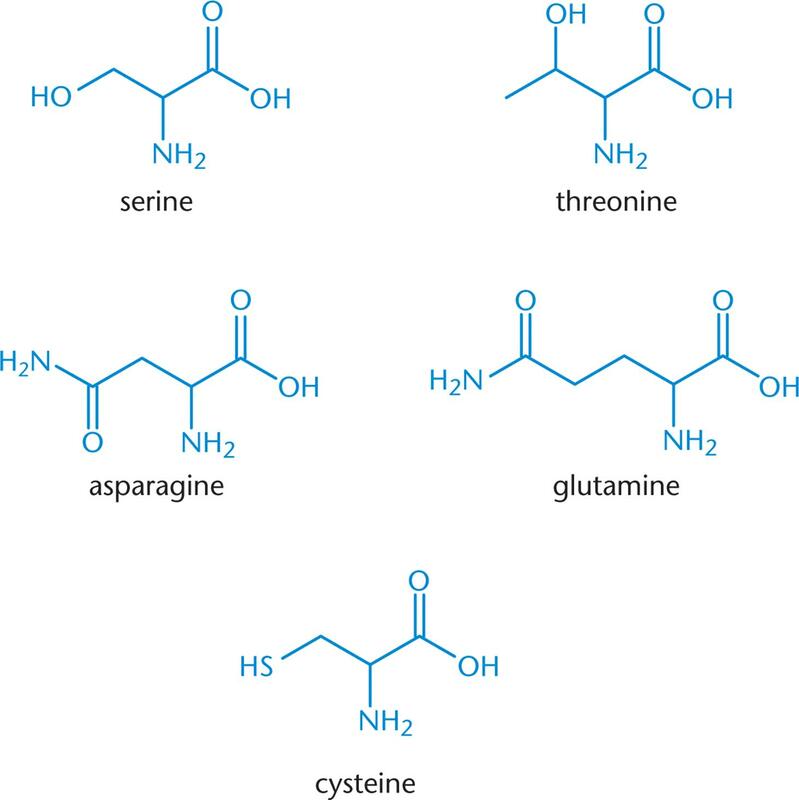 Except for glycine, all amino acids are chiral—and except for cysteine, all of them have an (S) absolute configuration. While L-amino acids are the only ones found in eukaryotic proteins, D-amino acids do exist. One example is gramicidin, an antibiotic produced by a soil bacterium called Bacillus brevis, in which D- and L-amino acids alternate in the primary structure. 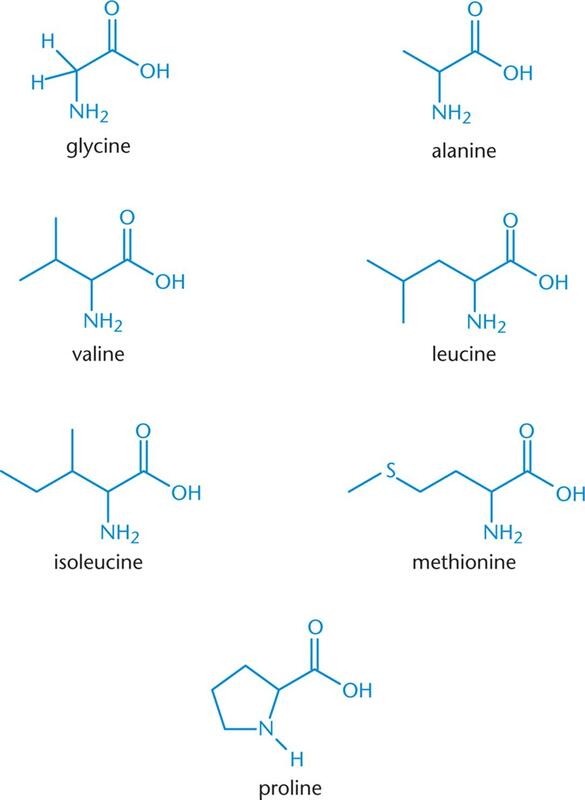 There are several ways to classify amino acids. In this section, we'll break them down by the structures of their side chains. Seven amino acids, shown in Figure 1.4a, fall into this class. Glycine, discussed earlier, has a single hydrogen atom as its side chain, and is therefore achiral. It is also the smallest amino acid. Four other amino acids—alanine, valine, leucine, and isoleucine—have alkyl side chains containing one to four carbons. The AAMC has not officially announced if test-takers are expected to recall the exact structures of the amino acids on Test Day. Kaplan recommends erring on the side of caution and assuming the structures are testable! Methionine is one of only two amino acids that contains a sulfur atom in its side chain. Nevertheless, because the sulfur has a methyl group attached, it is considered relatively nonpolar. 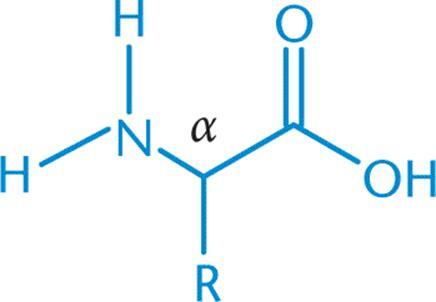 Finally, proline is unique in that it forms a cyclic amino acid. In all the other amino acids, the amino group is attached only to the α-carbon. In proline, however, the amino nitrogen becomes a part of the side chain, forming a five-membered ring. That ring places notable constraints on the flexibility of proline, which limits where it can appear in a protein and can have significant effects on proline's role in secondary structure. The MCAT writers strive to avoid misuse of terminology. Some textbooks problematically describe proline as an imino acid because the amino nitrogen forms two bonds to carbon. The MCAT won't use this term because an imine is specifically a molecule with a carbon–nitrogen double bond. Three amino acids have uncharged aromatic side chains, and are depicted in Figure 1.4b. The largest of these is tryptophan, which has a double-ring system that contains a nitrogen atom. The smallest is phenylalanine, which has a benzyl side chain (a benzene ring plus a –CH2– group). 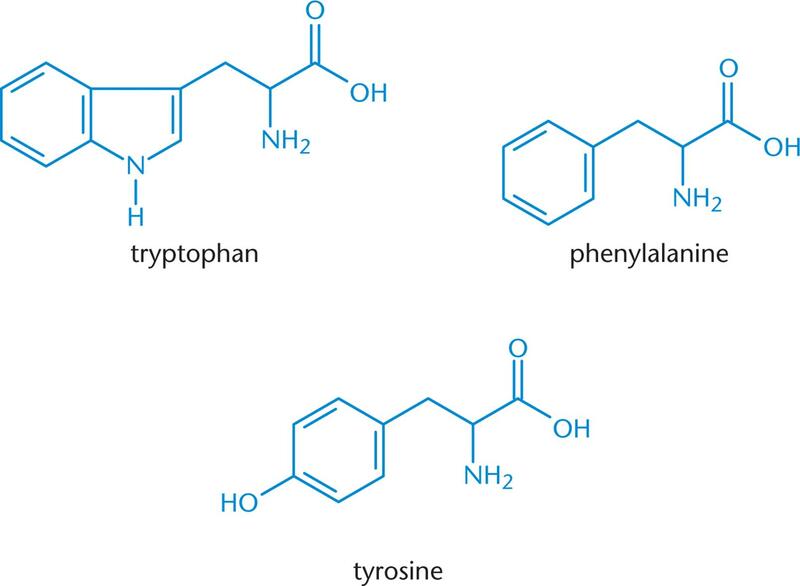 Adding an –OH group to phenylalanine gives the third member, tyrosine. While phenylalanine is relatively nonpolar, the –OH group makes tyrosine relatively polar. Five amino acids, shown in Figure 1.4c, have side chains that are polar but not aromatic. Serine and threonine both have –OH groups in their side chains, which makes them highly polar and able to participate in hydrogen bonding. Asparagine and glutamine have amide side chains. Unlike the amino group common to all amino acids, the amide nitrogens do not gain or lose protons with changes in pH; they do not become charged. Make sure you know your carboxylic acid derivatives for Test Day! They are discussed in Chapter 9 of MCAT Organic Chemistry Review. The last amino acid with a polar side chain is cysteine, which has a thiol (–SH) group in its side chain. Because sulfur is larger and less electronegative than oxygen, the S–H bond is weaker than the O–H bond. This leaves the thiol group in cysteine prone to oxidation, a reaction we'll study later in this chapter. Only two of the 20 amino acids have negative charges on their side chains at physiological pH (7.4). Those two are aspartic acid (aspartate), which is related to asparagine, and glutamic acid (glutamate), which is related to glutamine. Unlike asparagine and glutamine, aspartate and glutamate have carboxylate (–COO–) groups in their side chains, rather than amides. Note that aspartate is simply the deprotonated form of aspartic acid, and glutamate is the deprotonated form of glutamic acid. These two amino acids are depicted in Figure 1.4d. The remaining three amino acids, shown in Figure 1.4e, have side chains that have positively charged nitrogen atoms. 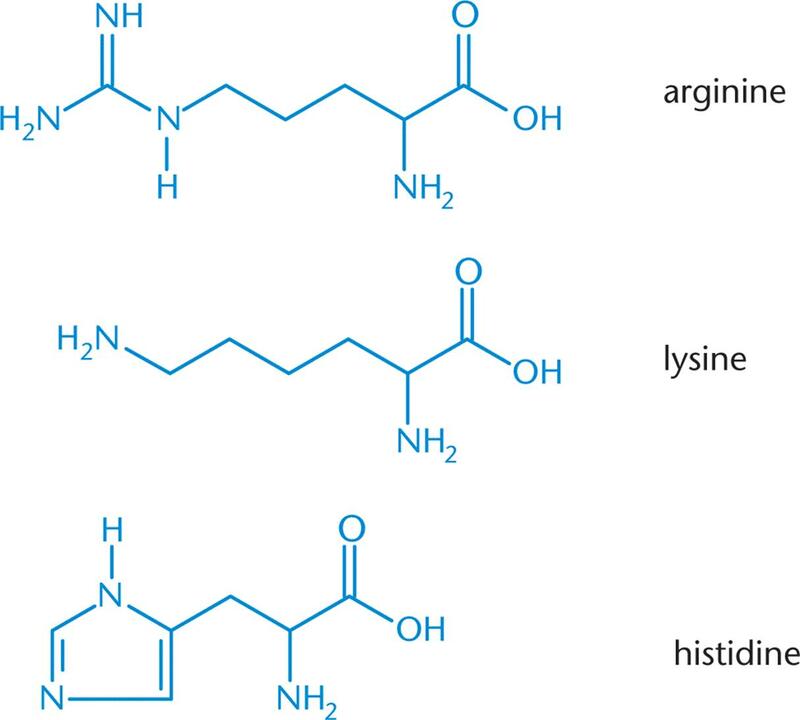 Lysine has a terminal primary amino group, while arginine has three nitrogen atoms in its side chain; the positive charge is delocalized over all three nitrogen atoms. 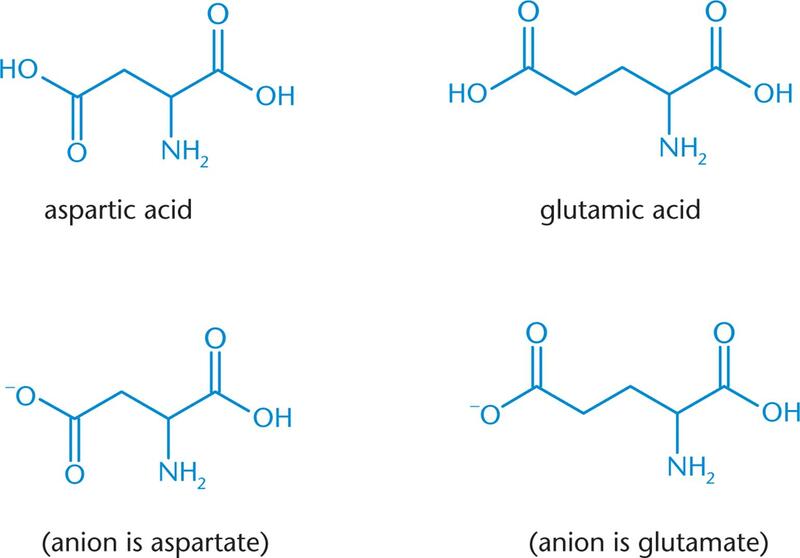 On the MCAT, you're likely to see anion names (aspartate and glutamate) instead of acid names (aspartic acid and glutamic acid) because most acids in cells exist in the deprotonated form. This also applies to molecules other than amino acids (malate instead of malic acid). The final amino acid, histidine, has an aromatic ring with two nitrogen atoms (this ring is called an imidazole). You might be wondering how histidine can acquire a positive charge. The pKa of the side chain is relatively close to 7.4—it's about 6—so, at physiologic pH, one nitrogen atom is protonated and the other isn't. Under more acidic conditions, the second nitrogen atom can become protonated, giving the side chain a positive charge. The catalytic triad found in chymotrypsin makes use of the histidine side chain's ability to gain a proton. The histidine residue in its active site removes a proton from the –COOH group in an aspartate residue, which can then deprotonate a serine residue. Chymotrypsin's role as a digestive enzyme is discussed in Chapter 9 of MCAT Biology Review. Classifying amino acid side chains as hydrophobic or hydrophilic is actually a very complex matter. For example, tyrosine has both an –OH group and an aromatic ring—so which one “wins”? A few clear conclusions can be drawn, though. First, the amino acids with long alkyl side chains—alanine, isoleucine, leucine, valine, and phenylalanine—are all strongly hydrophobic and thus more likely to be found in the interior of proteins, away from water on the surface of the protein. Second, all the amino acids with charged side chains—positively charged histidine, arginine, and lysine, plus negatively charged glutamate and aspartate—are hydrophilic, as are the amides asparagine and glutamine. The remaining amino acids lie somewhere in the middle and are neither particularly hydrophilic nor particularly hydrophobic. The surface of a protein tends to be rich in amino acids with charged side chains. Strongly hydrophobic amino acids tend to be found on the interior of proteins. 1. What are the four groups attached to the central (α) carbon of a proteinogenic amino acid? 2. What is the stereochemistry of the amino acids that appear in eukaryotic proteins? 4. Where do hydrophobic amino acids tend to reside within a protein? What about hydrophilic ones?